The Internal Revenue Service (IRS) is a government agency that is part of the Department of the Treasury. This agency is responsible for tax collection and providing assistance to taxpayers. Tax assistance can come in the form of deductions, rebates and bonuses. One specific instance of tax assistance is the Section 179 Tax Code deduction. You have perhaps heard of this deduction but aren’t entirely sure if your business can benefit from it or how exactly it is implemented. The Section 179 IRS tax code is not a complex operation. It is designed to offer tax relief to businesses, specifically those that are small in nature. So, how does it work and what do you need to claim this tax relief? 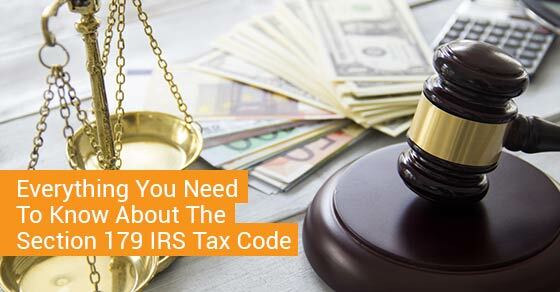 The IRS Tax Code’s Section 179 was created to allow a business to deduct the full purchase price of financed or leased equipment and off-the-shelf software. The Section 179 deduction is only available for the current tax year. This year’s deduction is only for 2016 and there are specific terms and conditions that must be met in order to claim this tax relief. You may have heard of the “SUV Tax Loophole” or the “Hummer Deduction”. These were previous iterations of the Section 179 deduction. They were once known as such because many businesses used this tax code to write off vehicles that qualified at the time (SUVs, Hummers, etc.). This time, qualifications are different and the Section 179 deduction gives businesses the chance to deduct the full purchase price of entitled equipment and/or software that was bought, financed or leased during the 2016 tax year. Because you can deduct the full purchase price from your gross income, the Section 179 deduction allows businesses the ability to buy quality equipment investing in the economy and themselves. What are the specific terms and conditions of this deduction? In order to claim the Section 179 deduction, the equipment financed or leased must be put into service during the same year that the deduction is being considered. For example, the equipment must be used and purchased/leased/financed between Jan. 1 to Dec. 31, 2016. Are their specified dollar limits involved with the Section 179 deduction? There are limits to how much each business can write off. For 2016, the write off caps at $500,000. The amount of equipment purchased is also limited to $2,000,000 for 2016. How does the Section 179 deduction work? When you purchase equipment or software for your business, it depreciates over time. Due to the depreciation, you are entitled to write off a certain amount of the price of the equipment each year. Instead of writing off a certain amount of depreciation each year, the Section 179 deduction allows you to write off the entire purchase price of the equipment or software for the current tax year if it was bought in 2016. By writing off the entire purchase price of the equipment or software and receiving a tax deduction, businesses can then use that amount to buy new equipment and software that will benefit their operation and help stimulate the economy. Do I have to purchase the equipment or can it be leased or financed? You do not have to outright purchase the equipment you are writing off as your Section 179 deduction. Leasing can prove quite advantageous in this instance since the amount of deduction may exceed the total amount of lease payments you make for the year. Leasing may not only be better for your business’ bottom line but for the Section 179 tax relief as well. Does the amount of equipment or software purchased, leased or financed over the 2016 tax year matter? Each year a spending cap is set. As long as you don’t go over that cap, you will still be eligible for the Section 179 deduction. The spending cap is set at $2,000,000. What equipment or software is eligible for this deduction? Structural components of your business that are not attached to the property, such as a printing press, manufacturing tools and equipment that is large-scale, external plant or factory, etc. Equipment that is purchased, lease or financed for personal and business use may be eligible and will be evaluated based on the percentage of time it’s used for business purposes only. Is there a difference between the Section 179 deduction and the Bonus Depreciation? As a business owner you may be familiar with the Bonus Depreciation. This allows businesses that are spending more than the Section 179 cap limit on new equipment to receive a depreciation bonus. The difference between the Bonus Depreciation and the Section 179 deduction is that the Bonus Depreciation only covers new equipment. On the other hand, the Section 179 deduction covers both new and used equipment. You may be eligible for both the Section 179 deduction and the Bonus Depreciation. Generally, the Section 179 deduction is applied first and then the Bonus Depreciation if applicable. Does the area I operate my business in effect the deduction? The area you operate your business in does not affect the deduction. But, there are three specific zoned areas that could see you eligible for a greater deduction amount. New York Liberty Zone: This zone refers to businesses that operate within specific areas of the borough of Manhattan. The additional deduction available to businesses in the New York Liberty Zone is $35,000 or the cost of the Section 179 property located within the zone and placed into service during the year 2016. Enterprise Zone and Renewal Community Businesses: This zone is typically found in metro areas of large cities that are in need of revitalization. Rural areas that need jobs also qualify under this zone. The additional deduction for the year 2016 is $35,000 or the cost of the Section 179 property located within this zone. Gulf Opportunity (GO) Zone (areas affected by recent Gulf Hurricanes): If your business is found in the FEMA defined areas affected by hurricanes Katrina, Wilma or Rita, you operate within the GO Zone. The additional deduction for the GO Zone is $100,000 or the cost of the Section 179 property located within this zone. You must ask the person in charge of preparing your taxes (accountant, tax professional, etc.) if you are eligible for any additional zone deductions. Who benefits from the Section 179 deduction? The section 179 deduction was designed as an incentive to stimulate small business growth. Section 179 aimed to create tax relief for small businesses; however, businesses of all sizes are able to benefit from Section 179. This deduction is one of the main incentives included in the recent batch of stimulus bills designated explicitly to help small businesses. A stimulus bill (often called a stimulus package) has the objective of reinvigorating the economy in order to stave off or reduce the effects of a recession, boost employment and increase spending. The Section 179 deduction falls under a recent stimulus bill because of its design to give small businesses a much needed tax break that allows them to flourish in a fallen economy. How do I acquire this deduction? There is some paperwork involved if you wish to acquire the Section 179 deduction. You will need to fill out something called Form 4562. You can find it here along with information on how to claim your deduction and what information about your business is needed. Your tax preparer (accountant, tax professional, etc.) can help. Once I have received this deduction do I need to display anything to prove it? You do not have to display a Section 179 deduction seal; however, it is always a good idea to show your customers that you are able to take advantage of economy-stimulating tax relief. By taking advantage of the tax benefits available to you, you are demonstrating a shrewd business acumen and helping spread the word about a deduction created specifically for businesses. Many of your customers may themselves be eligible for the Section 179 deduction and not be aware of it. Through the display of a Section 179 deduction seal, your customers will be able to learn more about the deduction and see if it’s right for them. You can get the seal here. Who Small businesses mostly, but all businesses are eligible. Why To offer tax relief for small businesses and allow them to write off equipment purchased, leased or financed. What A deduction of up to $500,000. Where Any business that operates within the continental U.S. There are certain zones where the deduction is increased. When Equipment must be purchased, leased or financed and put in use between Jan. 1 and Dec. 31 of the current tax year of 2016. How Apply through your tax preparer (accountant, tax professional) or online.